Another senior football contest that went down to the wire, though Galway may feel that had they lost this game, they would have given it away. At one point the Tribesmen led by 6 points coming into the final quarter and were sitting pretty. Christopher’s kept with it and drew level with 2 minutes to go after a James Horgan goal, one that followed an Eddie Goggin strike. Galway, however, came back and slotted two points over the bar to capture the points. Cian Darcy moves in block James Horgan's shot. Galway finished the first half well to go into the break with a three point lead. In the final 10 minutes, Galway outscored Christopher’s by five points to one. Galway’s forwards were all on form, Alex Kenny, Cian McMonagle and Ryan Forde all hit the mark down the stretch. The early exchanges saw a goal for each side. Eddie Goggin netted for Christopher’s following a well worked move, while for Galway it was a penalty that brought them level. Forde was pulled back by Martin Coppinger and the spot kick was dispatched by Kenny. Christopher’s well in the game but with work to do to rein in Galway’s strike force. Galway started the second half the way they ended the first, with a series of rapid fire points. Alan Egan was always available in the middle of the field, and the Galway half back line did enough to disrupt Christopher’s efforts. Galway’s lead was extended by another 3 points, with McMonagle, Egan and Kenny doing the damage. It was Goggin who Christopher’s relied on for their scores, and as time wore on it was clear that it would goals that were needed. A goal did come, from Goggin, following a high ball into the box to Dan Kenneally. After the teams traded scores, and with full time minutes away Christopher’s leveled the scores with a second goal, this time from substitute, James Horgan. David Murphy on the ball for Galway. Immediately from the kickout, however, Galway rallied with Cian Darcy winning a clean kickout to put Galway on the attack, and subsititute, Brian Reape, putting a close range free over. Reape added a second for comfort, and Christopher’s final chance ended up over, rather than under, the bar with the players crowded into the box under a dropping ball. Galway with their second win, and Christopher’s one step closer, but no cigar. Galway: Jamie Kelly, David Murphy, Ruairi Greene, Stuart Cullen, Dylan McHugh, Kieran Molloy, Cian Darcy, Alan Egan, Jamie Kehoe, Alex Kenny, Ryan Forde, Kevin Cummins, Cian McMonagle. Christopher’s: Mark Delaney, Martin Coppinger, Mark Killeen, Paudie Kenneally, Sam Ryan, Greg Henry, Sean O’Leary, Dan Grehan, Coleman Kennedy, Conor Horgan, Shane Dooey, Eddie Goggin, Dan Kenneally. There are 3 senior football matches on Sunday, each with its own tale to tell. At 1:15 Galway will try to make it a second win of the season when they meet Christopher’s. Christopher’s are trying to tally their first win of the season in their third outing and have yet to put together a full 60 minutes of coherent football. With players of the caliber of St. Finbars man, Sam Ryan, at corner back, Dan Grehan in midfield, and Eddie Goggin up front the potential is certainly there for them. Galway looked very good last week in their outing against Aidan McAnespies and what must have been encouraging for them was coming through a close game against a previously unbeaten side. There are match winners in Kildare man, Cian McMonagle, Monivea's Craig Kennedy, and Alex Kenny up front, while the back line is solid and will not give much away. Going to be an interesting one indeed. Next up are the Gaels and McAnespies. Another intriguing contest with each team coming off a loss in their last outing. The Gaels were well beaten by Donegal, while the Macs came up ever so slightly short versus Galway. The Gaels have plenty to pick from, and perhaps that is part of their Achilles heel in trying to decide on the starting 13. McAnespies on the other hand have had a well settled team since May, introducing newly registered players without upsetting the whole apple cart. Key for the Gaels will be the 2 Dans from opposite ends of the country. Dan O’Driscoll from Cork will be important in the middle of the field and Dan Lowe from Stewartstown County Tyrone up front will be looking to create the openings. The home based veterans, David Black, Coleman Mulkerrins, and Ryan Caffrey will be looked to set the example and dig in when the going gets tough. McAnespies have a strong, solid side with Sallins men Paul Clifford and Eoin Delmer at the back, while Che O’Donnell up front can break a tackle or two when in possession. Robbie Crofts guile will be important up front; the Naomh Barrog man did not have a great outing last week and will be looking to correct that. Expect a close one, and perhaps a firework or two as each side will be eager to set things straight again on Sunday. The final game of the Sunday at 3:45 features high flying Donegal and last years champions, Wolfe Tones. 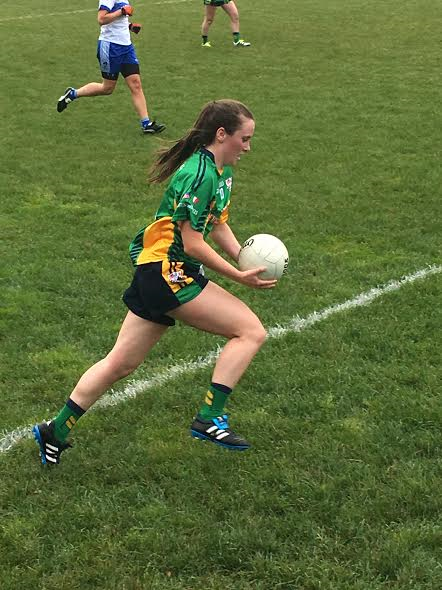 Donegal came away with a one goal win last week in somewhat of a grudge match against the Blues. The northerners needed substitute Lee Carr to come up with a couple of scores at the end to rest easy against the 12 man Blues, and might still be looking for better from one or two of the starting 13. Stephen McBrearty is the key man and steady influence for Donegal in the middle of the field. The Kilcar native never loses the head and uses the ball well, seldom wasting possession. Up front it is Adan Neilly who is the dangerman at corner forward, and the Tones will do well to minimize his impact on the game. The Tones are doing well so far. At center forward Shane McGuinness has been a revelation, while Jarlath Boyce the main influence in the middle of the field. The Tones will do well to keep themselves in this game as Donegal are one of the fancied teams this year, however a lot of resilience has served them well so far and may continue to do so on Sunday. Junior A hurling sees Offaly and Tom’s on their first outings of the year on Saturday afternoon. Offaly captured the Eddie Treacy Cup last season in convincing style and will be looking to get their defence off to a winning start. Sunday Galway and Tipperary meet. Tipp have looked impressive this year in their 2 outings, winning the Kieran Sheehan Cup and then last week a one sided win over Wexford earned their first 2 points. For Galway is a first outing and Tipp will prove a tough test for the westerners. The junior C hurling championship also continues in Concord, NH and Portland ME at the weekend. Barley House Wolves are looking to make it 3 for 3 at home to Hartford, and Portland will be looking for their first win of the season at home to Worcester. Plenty of junior football action in store as well. Cork looking for a second junior A win, while Hartford travel to play the rebel’s junior B’s in Canton. Canton will also see the first outing for the Kerry club as the Kingdom started their revival with a win in Hartford two weeks ago. The Shamrocks and Connacht ladies also meet in a ladies junior encounter on Sunday to start Field B proceedings. So, lots to look forward to and if last week is anything to go by, there is the potential for a couple of crackers. If the opening game of the senior hurling championship is anything to go by, it is going to be a tight contest between the two teams for the Boston senior title. There was never more than a point between the teams until injury time when Galway went up by 2, only for Brian Ramsey to net on the stroke of full time and hand Tom’s the win in the first game of the series. Seven of the first 8 scores of the game came by way of the free. It was John Coleman for Galway and Stiofan McMahon for Tom’s. Each player was equally on the mark, with Coleman hitting 3 and McMahon 4 in the opening exchanges. The game started to open up and the tempo increased as time wore on. Tom’s got some great work out of their corner backs, Brian Flynn and Donal Coughlan, and added to their tally with some impressive scores from open play. McMahon struck one from a tight angle, while MJ Sutton returned a puckout to send it back over the bar. Galway’s Jamie Barron was influential in the middle of the field along with James Tyrrell, while Coleman and Sean Lordan pointed from open play for the Tribesmen. At the break Tom’s held the advantage, 8 points to 6. With 15 minutes to go the teams were tied. Galway got some good play from their half back line. Rob Flynn, Conor O’Neill, and Martin Doyle did well, as did Willie Hahessy at corner back. Flynn put a lovely score over the bar, while it was the dead ball striking of Coleman that continued to keep the scoreboard ticking over for Galway. Shane Ryan tried to keep things going in the right direction for Tom’s, himself taking a nice score. Each side made changes to try and tip the scales in their favor. There were chances on either side, with Tom’s frequently working the ball to Cormac Joyce-Power around the 21 yard line, but nothing seeming to materialize. Galway's Conor O'Neill and Tom's Stiofan McMahon. Galway continued to punish Tom’s with Coleman’s free taking and with 5 minutes to go a 65 yarder was sent over by the corner forward to give Galway the lead. The score was answered by Sutton with a long ranger and the sides were level again. Galway opened up a two point lead with Coleman frees, and the win looked to be in the bag for the tribe. Tom’s were not done however, and with the last attack Ryan was found rushing in from the wing and the St. Finbars man buried it to the cheers of the Tom’s crowd. Tom’s one win in the bag in this best of 5 games. Tom’s: Liam Doyle, Brian Flynn, Donal Coughlin, Shane Taylor, MJ Sutton, Shane Dooey, Robbie Carew, Shane Ryan, Brian Ramsey, Dylan Costello, Stiofan McMahon, Aaron Moore, Shane Howley. Galway: Gavin Power, Willie Hahessy, Colm Daly, Martin Doyle, Conor O’Neill, Rob Flynn, Jamie Barron, James Tyrell, Sean Lordan, Padraic O’Leary, Cathal Bolger, John Coleman, Conor Murphy. The opening junior A hurling match was a fairly one sided affair as Tipperary got their campaign off to a flying start. By the time half time came around the Premier County side held a double digit lead and a man advantage one the field. Wexford struggled to keep it close, however, had they taken their scores earlier in the first half it could have been a different game. Tipp's Simon Kennedy with the eyes on the ball. Three Tipperary goals and a host of Wexford misses conspired to have the Premier men sitting on a healthy half time lead. Tipp had tallied 2-2 before Tom Moloney got Wexford off the mark with a point. Russell Quirke and Sean Stafford hit the majors for Tipp. Greg Burke pointed another for Wexford and with the chance to get into the game the Slaneysiders proceeded to hit several chances wide of the posts. Tipp maintained their lead thanks to the free taking of Sean Stafford, while Eoghan Kavanagh took over the free taking duties for Wexford. As the half time break approached, Wexford missed another chance, this time a goal opportunity, and Tipperary netted a third time. It was Quirke who found the net for a second time to put the game well and truly beyond Wexford. Following the goal a few punches were thrown resulting in a red card for Wexford goalkeeper, Jamie Keogh. At the break it was a 12 point advantage for Tipperary. The second half saw Tipp extend their lead and with the extra man there was little hope for a Wexford comeback. Strikes from Pat Moriarty, Jimmy Maher, and 4 Stafford frees (the St. Martin’s man hardly missed) had the matter pretty much put to bed early in the second half. Dinny Cross and Maher capped off the scoring in a dominant performance. Wexford: Jamie Keogh, Eddie Murphy, Tom Davey, Jason Foley, Denis Brennan, John Taggert, Greg Lundy, Tom Moloney, Sam Lenihan, Jamie Rath, Greg Burke, Eoghan Kavanagh, Kevin Joyce. Tipp: Sean Delaney, Cathal Madden, Sean McGarr, Mark Jordan, Cronan Dempsey, Paul Morris, Pat Moriarty, Simon Kennedy, Dinny Cross, Jimmy Maher, Kieran Lowrey, Russell Quirke, Sean Stafford. 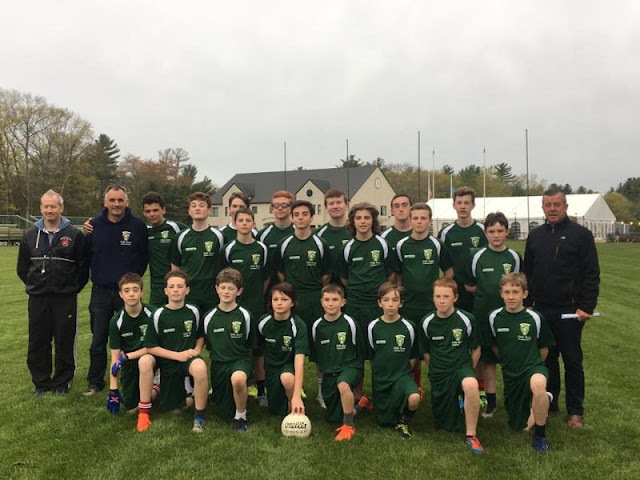 The time is almost upon us for the U14 feile team to travel to Ireland for the second year running, and represent the division at the annual John West Féile Peile na nÓg tournament. The team contains a mix of players who have the experience of last year’s tournament under their belts and kids who are going for the first time. The chance to represent Boston and play in Ireland is a key part of the youth development efforts. Back Row L-R: Pat O'Malley, Martin Kerr, Dylan Murtagh, Liam Davoran, Conan McCusker, Colm Faherty, Eoin Morissey, James Newell, Liam McGowan, Davey Murtagh, Thomas Murray, Eoin Faherty, Aidan Flanagan, Brendan Smith, Mick Sammon. Front Row L-R: Kian Hanbury, Aidan O'Malley, Ciaran McGurran, Declan Walsh, Daragh Jordan, Griffin Harvey, Aidan Skillin, Luke Sammon. (Not in Pic Cathal Carney, James O'Neill). The preparation required to ready the team, fundraise, find sponsors, and organize the trip is not to be underestimated. Practice and preparations began last fall, with a committee forming and practices for the players. An eager group took the reins and with help from some who had been through the experience last year, the endeavor is about to come to fruition. The team will acclimatize with a challenge game against Cavan club, Shercock, on the Wednesday before the first tournament game. Corduff, which is located a little to the north of Carrickmacross, is hosting the Boston boys and Friday June 23 the team opens the tournament with games against Aughnamullen and San Francisco. A huge part of the experience includes players staying with their host families, and Friday the kids will meet their hosts and spend 2 nights with them. Saturday June 24 is the date for the matchup with the host club, and depending how the games go it could be off to Lisnaskea, Co. Fermanagh for the quarter final. A big thank you to all who helped with the organization, and the team sponsors - New England Building Supply for the training kit, Lucy’s Restaurant for the track suits, and the Glynn Hospitality Group for the jerseys, and Keash excavation for the gear bags. Also, special thank you to treasurer, Kelly McCarthy, and to Margaret Riordan who put in countless hours co-ordinating affairs with the folks in Ireland in the early morning hours. The players who will be traveling are: Cathal Carney (Wolfe Tones, Springfield), Aidan Skillin (Trinity, Milton), Aidan Flanagan (ISYL, Watertown), Colm Faherty (Trinity, Milton), Luke Sammon (Trinity, Milton), Conan McCusker (ISYL, Dorchester), Kian Hanbury (St. Brendan’s, Dorchester), Dylan Murtagh (ISYL, Dorchester), Eoin Morissey (ISYL, Watertown), James Newell (ISYL, Weymouth), Liam Davoran (ISYL, Milton), Thomas Murray (Trinity, Milton), Declan Walsh (Trinity, Milton), Aidan O’Malley (ISYL, West Roxbury), James O’Neill (St. Brendan’s, Milton), Darragh Jordan (Trinity, Milton), Eoin Faherty (Trinity, Milton), Griffin Harvey (ISYL, Stoughton), Brendan Smith (ISYL, Quincy), Liam McGowan (St. Brendan’s, Weymouth), Ciaran McGurran (St. Brendan’s, Weymouth), David Murtagh (Trinity, Milton). Coaches: Martin Kerr, Mick Sammon, Pat O’Malley. Goals win games as the saying goes, and it was the Wolfe Tones who scored 4 of them to kill Galway’s efforts at getting a win in their first outing of the season. Two goals in each half kept the Wolfe Tones on top, and a commendable late rally by Galway was never going to be enough to bridge the gap between the teams. Two first half goals saw the Tones into a half time lead. Shane McGuinness and Cormac McWalter each netted in the first 15 minutes. Galway had started well, and in the first 10 minutes wasted a handful of early chances to establish a lead while attempting to go for an early goal. It was the Tones who got the early goal from McGuinness following a point by Ferghal O’Brien. Ryan Ford got Galway off the mark with a point, only for the Tones to come storming downfield and Cormac McWalter netted, delivering another early blow to the Brighton side. The teams traded points for the remainder of the half, with the Tones looking the more fluid side, with McGuinness at center forward full of running and opening the spaces. O’Brien and McGuinness converted for the Tones, while for Galway it was Cummins and Ryan Ford with the points. The Tones had a great opportunity to put the game to bed early after McGuinness was pulled down in the box. The Ballybay man stepped up to take the kick, but his well hit shot cannoned off the foot of the post. At the half the Tones were 2 goals to the good, 2-5 to 0-5. The Tones lead ballooned to 11 points early in the second half. The Tones had netted a third following a high ball into the box that was picked up by Darren Maguire and the Kilcock man netted easily. Points were added by McGuinness and McWalter and the game looked fairly done and dusted. Galway made it interesting late in the second half, however. The Brighton men started to play some good football, but had left themselves too much to do and may have wondered after the game how things might have transpired if the early chances were taken and the team had settled into the game. Ford and Kennedy pointed, and the introduction of substitute, Cian McMonagle paid dividends. The tribesmen moved the ball well to finish the game, and pointed 6 times on the trot to give themselves some hope. McMonagle’s introduction was a revelation and the boot of the man from Clogherinkoe, Co. Kildare, pulled Galway back within range of their opponents. One wondered why the sharpshooter had not been brought into the fray sooner. With Galway knocking on the door a goal would have reduced the gap to a point and made the final few minutes very uncomfortable for the Tones. Jarlath Boyce put an end to any chance of that as the Tones midfielder pointed, and then followed with a goal to secure the points. Tones with the win, Galway left wondering what might have been. Galway: James Kelly, Dan Murphy, Rory Greene, Kieran Molloy, Stuart Cullen, Kian Darcy, Sam Linehan, Ryan Ford, Kevin Cummins, Craig Kennedy, Jamie Keogh, Alex Kenny. Tones: Darren McDonnell, Jack Smith, James Reilly, Patrick Collins, Tom Quinn, Darren McGuire, Jarlath Boyce, Garvin Jones, Mike O’Brien, Shane McGuinness, Ferghal O’Brien, Cormac McWalter, Conor Marsden.